This week is Sheets Week, a time that Curbed LA has designated as their chance to celebrate Millard Sheets, the artist and architect whose studio is most famous for creating colorful mosaics that in the 1950s began dotting the facades and interiors of Home Savings and Loan branches throughout Southern California. From Encino to Claremont, virtually no corner of Greater Los Angeles was spared from Sheets’ contracted art pieces. And though banks have changed hands over the years and many of Sheet’s murals have been removed, many more are still around, providing ambiance for an entirely new generation of people conducting financial transactions. Since Curbed spent their Sheets Week focusing on the artist’s works in Hollywood, Pomona and Claremont (the latter of which is where Sheets taught at Scripps), the Post spent Sheets Week delving into the two Long Beach works that have been attributed to his studio. But as with many aspects of Long Beach history, the truth about both their origins and their current states remain murky. In 1979, the space above the front door of the Home Savings and Loan branch on the corner of Long Beach Blvd. and Ocean Ave. became graced with a mosaic mural. The Long Beach scene—which depicts oil rigs, ships and images of rancho life—was designed by Susan Hertel, head mosaic designer at Millard Sheets Studios. 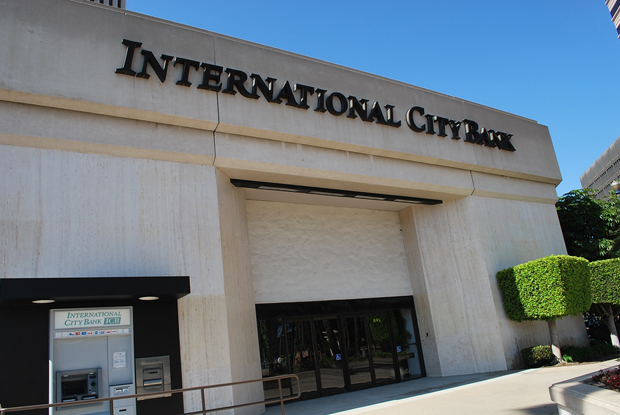 Today, however, the 18 foot by ten foot square above the entrance to what is now International City Bank is stark white. Local historian Maureen Neeley says the art was covered up at some point—probably when the Home Savings and Loan branch closed sometime in the 1990s—but the lights are still in place to illuminate what was once public art. How, exactly, it was covered up, though, remains in question. Was it plastered over? Encapsulated in a plaster build-out? Was it removed entirely? 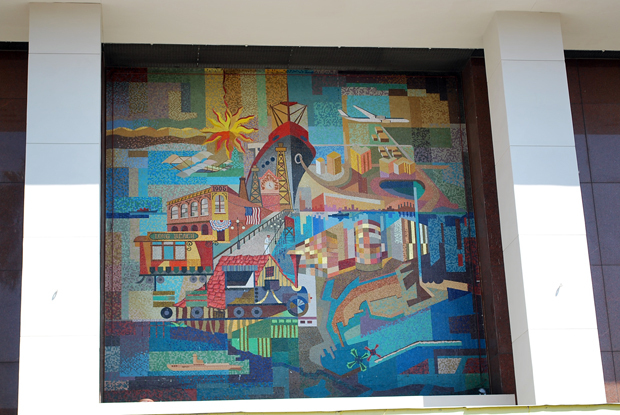 One commenter on a Sheets research blog said that he worked at Home Savings and Loan’s corporate headquarters in Irwindale in the 1990s and that he was told the two Hertel mosaic panels in the lobby had come from the Long Beach branch. But Scripps College—who purchased much of the mosaics from HS and L’s main office when it closed—could not confirm that they had any that were once in Long Beach. So where did the mural go? A current up-close photo of the seemingly solid white spot above the door reveals that it is actually a series of little pieces of something that has been painted over white. Whether the pattern of those correspond to the mural that once was there is hard to tell—the only photo of the mural that exists is a grainy black-and-white image unearthed from the Long Beach Public Library archives (above). If the tiles used were actually colored glass and they actually were just painted over, then Neely’s idea of eventual re-use could be correct. Some paint stripper could easily be applied, the paint removed and the mosaic would look as good as new. If the mosaics were painted glass, however, painting over them would not preserve it. That is, if the mural is there at all. A second mural that has been attributed to Millard Sheets’ Studio sits above the entrance of what used to be a Bank of America branch and is now the under-construction Vault 350 music venue. The artist’s true contributions to the work, however, remain in question. The colorful mural of another—this time vertical—Long Beach landscape is undoubtedly in the style of Sheets’ other bank-facade panels, but the name of the artists who eventually took credit for it (Ben Mayer and Maurice Sands) have never been affiliated with Sheets’ studio. 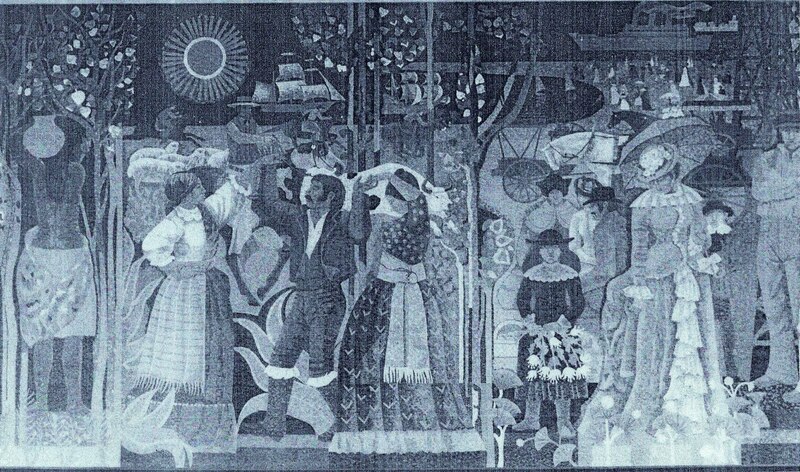 According to Sheets researcher Lillian Sizemore, the true history of this unsigned Long Beach work is made even more confusing by the fact that it was commissioned in tandem with another BofA mural in Van Nuys, which bears Millard Sheets’ signature. California art lover Adam Arenson found correspondences of Sheets’ where he wrote that he was “deeply interested” in the work, and that it would be “a great pleasure to research,” but there is no record in his invoices that suggest his studio ever completed it. 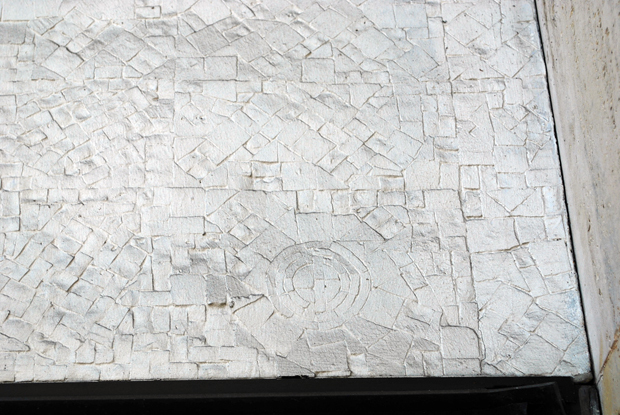 Because the mosiac’s seams are visible up close (indicating that the planel was built through a series of squares instead of irregularly shaped pieces), the work is also unlikely to be that of Sheets’ studio. So what is the best guess on Sheets’ involvement in the 350 Pine Ave. mural? Arenson seemed to agree that Sheets probably just served as an art broker, connecting clients and designers with fabricators and locations just as he did with some of the Interspace works at Disneyland.